Utah drinkers get the bum's rush. Imagine this: You walk into a bar specializing in wine—aka a wine bar—but which also offers a large inventory of beer, cocktails, tapas and such. On the wine side, there are 144 choices available by the 1-ounce splash, 3-ounce taste, 5-ounce glass or by the bottle. Wine prices range from a buck or so for a splash of inexpensive Spanish white wine to more than $100 for a glass of Opus One; and selections run the gamut from French rosé and Kiwi sauvignon blanc to Cabernet Franc and port. Sounds a lot like our own BTG Wine Bar, right? It isn't. The wine bar in question is called Bodovino, and it's located in Boise, Idaho. My first reaction upon getting comfy with the Bodovino way of doing business was, "We need one of these in Utah!" But, it ain't gonna happen. Not here. Not ever. Here's why: Bodovino (which is an amalgam of "Boise, downtown and vino) is a self-service wine bar. Sure, you can belly-up to the bar and have a friendly server or bartender pour wine and drinks for you, but you don't have to. 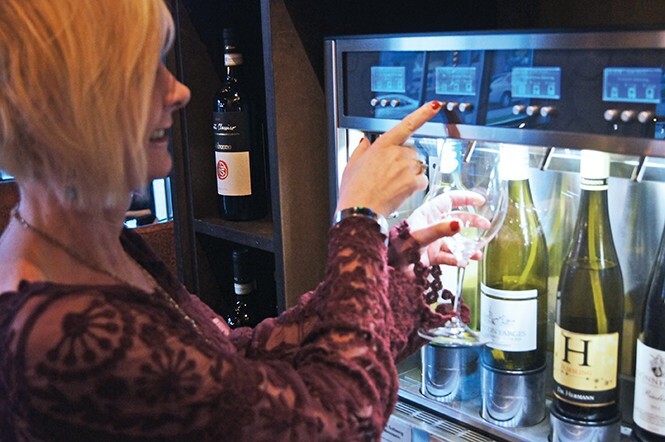 This Disneyland for wine enthusiasts consists of a temperature-controlled wine system—the type you see in many wine bars—but the wine dispensers are scattered throughout the sprawling restaurant/bar and customers serve themselves. You know, like at self-serve fast-food soda machines. It's a sort of Dave & Buster's type operation where, upon entering, customers show ID and then load a plastic card with as much or as little money as they'd like. They are then handed a high-quality wine glass and instructions on operating the self-serve wine dispensers, and then proceed to sample wine in whatever amounts they'd like: splashes, glasses, etc. The electronic wine dispensers precisely pour the amount of wine ordered and subtract the price of the pour from your card, which you can reload at any time. It's brilliant—and fun. Which is why we can't have it here. Since the Utah Legislature insists on treating adult alcohol imbibers as mindless, out-of-control children, hell will freeze over or Jesus will visit the Americas (again) before drinkers will be allowed to dispense their own booze in a public space. But why not cut out the middleman? After all, you'd have no one to blame but yourself for being overserved if you were doing the pouring, right? The state could abolish those silly TIPS (Training and Intervention Procedures for Servers) classes, and tipping your bartender would become a quaint practice of the past. It's possible you might be concerned that if a single glass of wine can put a person over the new .05 blood alcohol limit, then unfettered access to 144 wines at a sitting might be a recipe for drunken disaster. No problem. AlcoMate is here to serve. There are concerned companies out there who want to help keep you out of jail in a buttoned-up, moralistic state like Utah. Revo—makers of AlcoMate digital personal breathalyzer—is one of them. This $219.95 gadget might seem costly at first, but not so much when you compare the price to the cost of a DUI. It's roughly the size of an iPhone, and is extremely accurate. I suggest slipping one into your glove compartment or purse before thinking about drinking and driving in Utah. Or, just go to someplace like Denver or Boise, where fun is still legal.